SILVIS, IL. – Local heroes Zach Johnson and Steve Stricker were in the hunt and the weather couldn’t have been better. That assured the John Deere Classic its best year for attendance and revenue since tournament director Clair Peterson invited Michelle Wie to spice up the field eight years ago. Johnson and Stricker, though, couldn’t deliver when the $846,000 first prize was on the line. 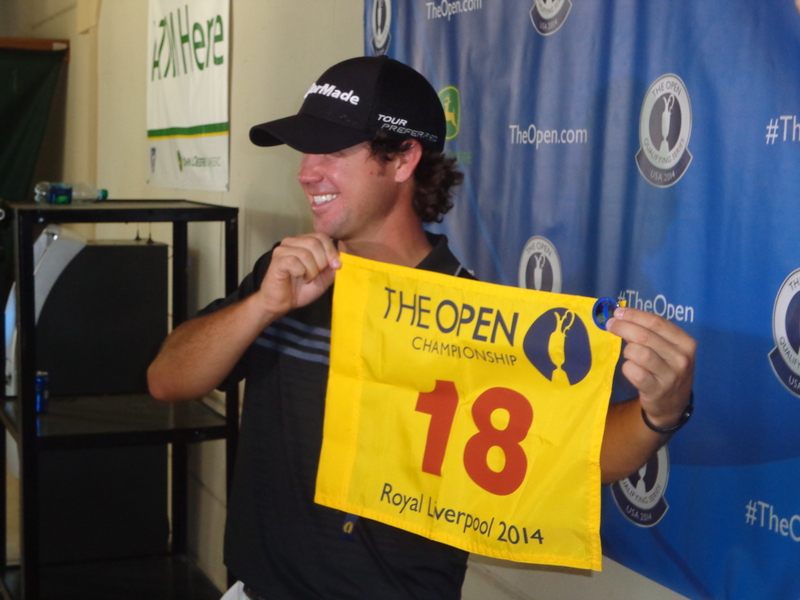 Brian Harman (below, celebrating his qualification for the British Open), stood the tallest on Sunday — even though the third-year left-handed hitting pro from Georgia measures just 5-foot-7. Harman didn’t have the resume that three-time winner Stricker had built up, nor could his compare with Johnson, who won here in 2012 and finished as the runner-up for the third time on Sunday. Harman, who started the tournament with a No. 115 world ranking, had never even led one round of a PGA Tour event until this week. All that didn’t matter once the final round firing began. Starting the day with a one-stroke lead on Stricker and playing in the final twosome for the first time on the PGA Tour, Harman showed he was up to the task early. He put his second shot on the par-5 second hole to four feet and made the eagle putt. Stricker had the dubious honor of watching Harman the rest of the way, and he could produce no better than a one-over-par 72 to finish in a tie for 11th. Johnson, playing four groups behind Harman, got home in 64, best round of the day. It was two better than Harman in the final round but one shy of matching him over 72 holes. Harman, who finished at 22-under-par 262, strung three straight birdies in a crucial stretch from holes 14 through 16. Three in front after that last birdie putt dropped, he nursed the lead through the last two holes. Harman was paired with Johnson in the JDC’s final round two years ago when Johnson emerged the champion and Harman tied for 19th in his first JDC. They’ve practiced together occasionally since then in St. Simon’s Island, S.C.
Harman admitted the previous pairing with Johnson had long-term benefits, but more went into this breakthrough win. That didn’t always work. He missed the cut at the Greenbrier Classic in his last tournament and made a 10-hour drive back to Georgia for practice and a thoughtful day on the beach before regrouping in the Quad Cities. Harman was 11-under-par on the par-5s this week, and TPC Deere Run has only three of them. The U.S. Junior Amateur champion in 2003, he had gone 88 starts without a win on the PGA Tour. His best results prior to Sunday were two third-place finishes. Both Harman and Johnson had caddie issues during the week. Johnson’s regular bag-toter, Damon Green, was playing in the U.S. Senior Open but Johnson said that didn’t affect the outcome. Harman’s caddie, Scott Tway, became ill during Thursday’s first round and Jay Hatch, a high school coach in Davenport, Iowa, carried the final 12 holes. Tway resumed his duties in the second round and finished the tournament. Harman became the sixth University of Georgia golfer to win on the PGA Tour this year and is the 21st first-time winner in the JDC’s 44-year history.